Nightline co-anchor Bill Weir on Monday couldn't help but fawn over former Obama White House social Secretary Desiree Rogers, lauding her as a "fashionable, vivacious, interesting, telegenic person in a town with not a lot of that, frankly." The journalist failed to offer much in the way of tough questions. Regarding the 2009 fiasco of having Michaele and Tareq Salahi crash a state dinner with the President, Weir gently wondered, "...What are your thoughts now that that night won't be remembered for [being a success]?" Instead, he hyped, "But in those heady days of Obama mania, how could anyone ignore the well heeled woman in charge of the guest list? The one who fit right in with Anna Wintour, Kanye West at fashion week, the one who beat the First Lady into the pages of Vogue?" Former White House social secretary Desirée Rogers has been named chief executive of Johnson Publishing Company, billed as “the world's largest African-American owned-and-operated publishing company.” JPC publishes both Ebony and Jet magazines. The Sunday Arts & Style section of The Washington Post offered the paper’s pronouncements on "The Best and Worst of 2009." The most noteworthy list came on Fashion from Post fashion writer Robin Givhan. 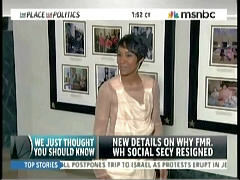 It might seem shocking that both Michelle Obama and her social secretary Desiree Rogers ended up on the Worst list. What’s more shocking is that they’re mentioned on the Best list, too – six times. 4. Miss California USA epitomizes all the reasons beauty queens should just stick to professing their support for world peace. When you stoop to calling Larry King inappropriate on his own show, you know it's time to just shut your trap. Yesterday at the daily White House press briefing, press secretary Robert Gibbs talked down to reporter April Ryan of American Urban Radio Networks (AURN), a journalist with nearly a quarter-century of experience. Ryan was pressing Gibbs over whether Desiree Rogers, the White House social secretary, essentially "invited herself" to last week's state dinner in honor of the Indian Prime Minister. Rogers has come under scrutiny for failing to have either herself or other social office staffers accompany Secret Service staffers who conducted security screenings for the dinner. Gibbs, annoyed by Ryan pressing the matter, chided Ryan to calm down and suggesting that she was throwing a tantrum much like his son sometimes does. While ABC’s Good Morning America and NBC’s Today questioned Obama White House senior advisor Valerie Jarrett on the breach of security at last week’s state dinner, her appearance was conspicuously absent from the CBS Early Show on Thursday. 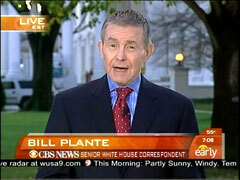 The CBS morning show has made a consistent effort to downplay the administration’s role in party crashing scandal. 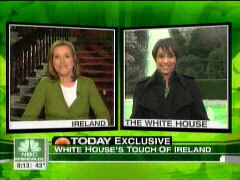 NBC's Meredith Vieira was so excited about White House social secretary Desiree Rogers' decision to honor St. Patrick's Day by having the White House fountain spray green water, that she exclaimed: "You're doing a fantastic job." But if the new social secretary, indeed, was doing such a "fantastic" job where was she when the decision was made to give the British Prime Minister Gordon Brown the tacky gift of 25 DVDs? Vieira, on Tuesday's "Today" show, interviewed Rogers as she stood in front of the green fountain and cooed that the Obamas: "Want this White House to be more accessible to the folks around the country. They call it the people's house." and asked, "How much input do they have in all of these decisions, Desiree, that are made?" Rogers responded that "we talk weekly about these decisions." However Vieira never questioned if it was the Obamas or Rogers that decided a box set of DVDs was a proper gift for Brown, considering the British Prime Minister delivered, as Newsbusters' Warner Todd Huston pointed out, the more thoughtful gifts of a: "Pen holder carved from the timbers of the sister ship of that which gave the wood to create the famous ‘Resolute Desk,' the desk that has been in America's charge since 1880. He also gave Obama the framed commission for that famous ship, the HMS Resolute. His third gift was a seven-volume biography of one of England's greatest leaders, Winston Churchill."